The main topic on the agenda of the ordinary February meeting of the Board of the Istanbul Chamber of Industry (ICI) was "The Return of the Production Economy and the Importance of Istanbul and Industrial Strategies in the light of Priority Transformation Projects." With ICI Board President Erdal Bahçıvan making the opening remarks of the meeting, the "Istanbul Industrial Strategy Document," a joint project of the Istanbul Development Agency and ICI that has been in preparation for the last year, was presented to ICI Board Members. The ICI February board meeting, which was presided over by ICI Board Chairman Zeynep Bodur Okyay, hosted Istanbul Commerce University Faculty Member Prof. Murat Yülek and Istanbul City University Faculty Member Associate Professor Melih Bulu as keynote speakers. 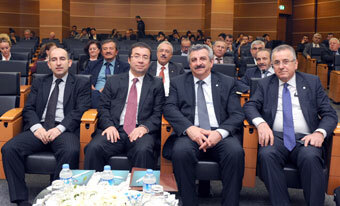 Before the presentation of Istanbul City University Faculty Member Associate Prof. Melih Bulu, who was responsible for the preparation of the strategy document, ICI President Erdal Bahçıvan provided some information on the "Istanbul Industrial Strategy Document" that had been prepared as a Chamber project, supported by the Istanbul Development Agency. 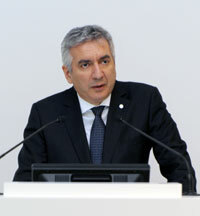 Bahçıvan explained that the first "Industrial Strategy Document" had been published in 2010 and covered the years 2011 and 2014, and that work was going on to update the document. He said that besides thinking about a strategy for the country, industrial strategies geared for cities should not be neglected. Pointing out that it was this awareness with which the "Istanbul Industrial Strategy Document" had been drawn up in this past year, Bahçıvan said that in the sense of a metropolitan industrial strategy, this was a "first" for Turkey. Bahçıvan said that after the government disclosed its "Priority Transformation Programs for the Economy," this would be the first response from the business community to produce a program that Prime Minister Davutoğlu was so avidly in favor of. 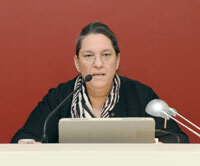 Bahçıvan explained that a road map for Istanbul Industry had been drawn up for implementers that would serve them until 2023. Bahçıvan asserted that if industry was left out of Istanbul's vision for the future and Istanbul was seen only as a center of finance, logistics and fashion, "In a city with such depth as Istanbul, with its position of being at the heart of the Turkish economy, industry means so much more and is such an integral part of the city." Approaches to the contrary, he said, will bring down the share of our industry in the national income to even lower levels than where it stands today at around 15 percent. Under the current circumstances, one of the most striking problems of Istanbul industry is the instability in the placement of production facilities within the city. However, it can be seen that there are many major metropolises around the world that refute this approach. Bahçıvan said that it would be impossible to speak of bringing to life the 2023 goal without formulating strategies for Istanbul, the city in Turkey that produces and exports the greatest volume of high-technology goods. 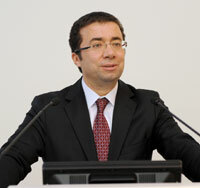 Bahçıvan stressed also that reducing Turkish industry's dependency on imports, increasing the utilization of local energy resources, supporting R&D activities by prioritizing technology-based sectors, diversifying and fortifying the industrialist's financial resources are all essential for Turkey's sustainable growth. Touching as well upon the issues that impact the competitive power of industry in terms of both exports and the domestic market, Bahçıvan called attention to the new production centers in Asia and Eastern Europe and the Transatlantic Trade and Investment Partnership that is expected to be signed between the EU and the U.S.
Also speaking at the meeting, Istanbul Commerce University Faculty Member Prof. Murat Yülek made a presentation entitled "Will Industrial Policy Make a Difference?" and explained how the industrialization process should progress. 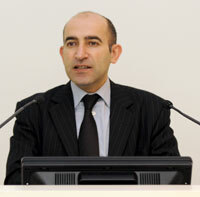 Stressing the importance of the manufacturing industry, Yülek compared the industrial policies that Turkey had adopted before and after 2002. Pointing out that industrial added value had shown a considerable increase in magnitude in the last 15 years, Prof. Yülek stated that industry was growing hand in hand with exports and that "Turkey demonstrated a considerably high increase in industrial added value in terms of magnitude in the last 15 years, but that in terms of volume, our industry was still smaller than that of the major economies." Informing ICI Board Members about the "Istanbul Industrial Strategy Document," Istanbul City University Faculty Member Assoc. Prof. Melih Bulu said, "The Istanbul Industrial Strategy will be a guideline for industrial enterprises that wish to direct the course of the transformation that Istanbul industry needs. This document has put together the transformation strategies that Istanbul industry needs to reach a level of high value added production and competitive power. The project has set forth a vision for the next decade of Istanbul industry, drawing from the contributions of Istanbul industrialists. This is why the recommendations of the industrialists were enlisted and an agreement was reached before producing this Istanbul Industrial Strategy Document."